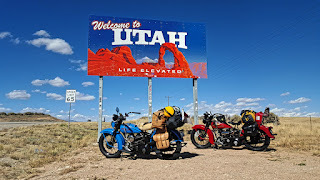 Riding into Monticello, UT, I got an idea of what it feels like to be in front of a sandblaster. An unyielding wind coming down from the mountains buffeted us with dust and grit as we made our way through town. When we pulled into a parking lot for lunch, we were forced to move the bikes against the building, just to make sure that didn't fall over while we were inside. Definitely not an ideal place for riding motorcycles. Traveling up 191, we started passing the red rock formations that this part of the country is known for. About half way to Moab, we pulled over at Wilson Arch which was located right next to the highway. I figured this would be our only chance to climb inside a stone arch, so we parked the bikes and made the short hike to the bottom of the arch. 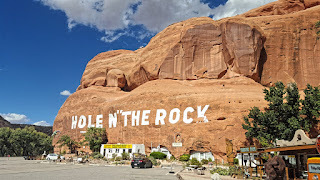 The next stop along the way was a place called "Hole in the Rock". It started out as a diner built into the side of the rock, but the owner seems to have gotten carried away and eventually carved out a 5,000 square foot home. This feat was completed using only hand drills, dynamite and a donkey to carry out the debris. The majority of the house was built over a 12 year period starting in the early 1940's, after which it was inhabited by the builder and his wife. Unfortunately, the builder died just 5 years later and never got to really enjoy his handy work or finish some of the additional renovations he had planned. 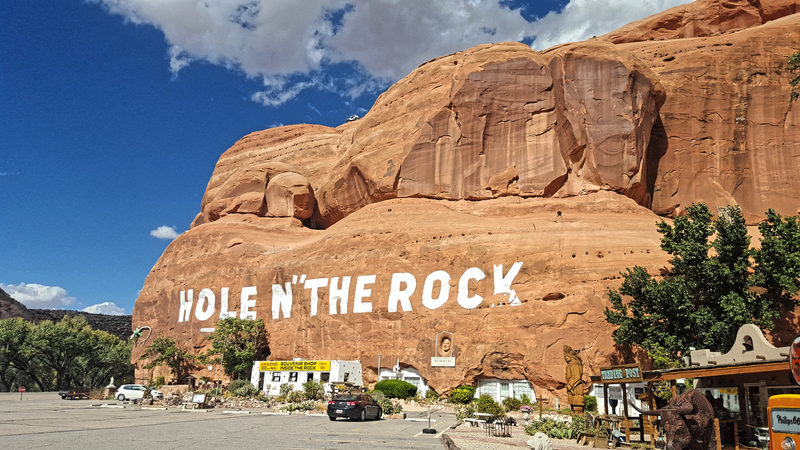 If living in a rock sounds like something you might consider, this roadside attraction is for sale. You just need $2.2 million and you can live inside your very own rock. As an added bonus, the property comes with a petting zoo too. We made it to the KOA campground just outside of Moab by mid afternoon and quickly set up camp. 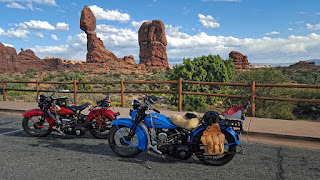 Then it was on to Arches National Park. This park is home to a staggering number of arches, spires, pinnacles and balanced rocks. At last count there were over 2,000 arches alone. 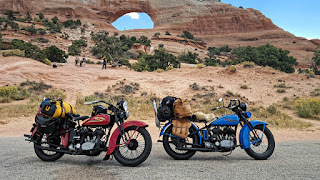 The ride through the park was incredible, with the landscape seeming to change ever few miles. 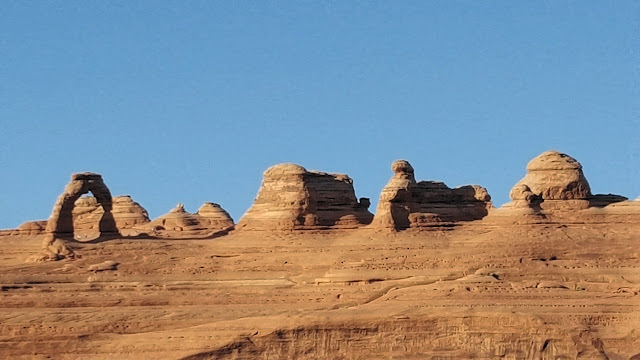 Many of the most famous features can be seen from the road, but for those that like hiking, there are some challenging trails that will take you right under some of the formations. We were pressed for time, so we opted to only do the short hikes of 1 mile or less. Even with that limitation, we still were able to view many impressive rock formations. We really packed it in today. Even with all the stops, we still made it another 160 miles closer to the Pacific.